We discovered a small, in-house, cafeteria up on the roof here this morning so we tried to see what might be on offer for breakfast. To our delight, such things as fried eggs and bread & butter were available so to make a bit of a change to our normal morning routine of late, we started our day off today with breakfast instead of lunch. It wasn’t a spectacular breakfast as it turned out but it was passable nevertheless and we both ate enough to swallow our daily malaria tablets. Tomorrow is the big tablet day. We take a couple of smaller anti malaria tablets of one description each day. Once a week, we take a couple of larger tablets of a different kind. This is mostly due to our having passed through India, which requires taking a couple of different types of prophylaxis to help prevent the different strains of malaria that are endemic there. Even though we’ve now passed through India, we still need to continue with the regimen for a full four weeks. We’ll probably need to pick up the regimen in Thailand again and the fact that our time here in China should last approximately four weeks means we simply won’t stop taking tablets for the foreseeable future. Neither of us looks forward to big tablet day since they taste vile even when you manage to get them down very quickly. You should see us try to get them down quickly and the resulting contortions on our faces when we fail to do so, as is invariably the case. With breakfast out of the way and full of vitalised energy, we set off to hail a taxi to take us to the Summer Palace, another one of the Beijing must-do’s, having first asked a reception worker to write down the destination in Chinese so that we could show it to the taxi driver. In this land of incomprehension, it’s these little things that we have to keep thinking of to prevent the nightmare scenario of being stuck somewhere with no clue how to get back and no way to communicate the need to do so with the locals. There are a couple of different kinds of taxis here. The cheaper ones start the meter running at ¥10 ($1,20) and charge ¥1,20 ($0,15) for each successive Kilometre travelled after the initial two or three. Distances here are vast and the Kilometres can add up quite quickly. Slightly larger and more comfortable taxis, allegedly, charge ¥1,60 for each successive Kilometre. Both types of vehicles are the same colour red and it is sometimes difficult to tell which type you’ve just hailed until it stops right besides you. We were lucky to have hailed one of the cheaper kinds this morning but I was still a little unsure about how kosher he was since there was a number 1.60 lit up on the meter. I tried to keep track of how fast the meter was incrementing every time it added another Kilometre but at the end of the trip, the driver switched off the counter quite quickly and I didn’t get to see the final numbers in time to determine if we’d been had or not. At a whopping ¥42 ($5), I thought it was quite steep, even though it’s all relative in the end, and wondered if we’d been ripped off or not. Regardless, we reached one of the entrances to the Summer Palace complex and bought our two ¥60 ($7,40) tickets to cover the cost of getting in plus three other attractions (galleries and the like) inside the grounds. We could’ve bought the cheaper ¥40 ($5) tickets if we’d known how to communicate with the woman behind the little ticket window. I showed her two fingers to indicate two people and she took a couple of ¥100 bills from the bunch of notes in my hand and returned a couple of tickets with ¥80 in change. She had effectively made the decision for us to go with the more expensive all-encompassing ticket as opposed to the cheaper one. Who was I to argue and just how exactly would I have do so anyway? Once inside the main gate, we were confronted with another round of touts selling anything and everything (mostly cheap, plastic crap) and guides offering their services. We marched merrily on right by them and into the grounds. That same blanket of misty fog that covers the entire city hangs thick in the air here also, even though the Summer Palace is quite a drive outside of town. Actually, Beijing is such a huge city, sprawled over a very wide area, it’s really only on the edge of town when you look at it on a map. Mist or no mist, the Summer Palace complex is still a site to behold. Our entry point placed us right at the foot of a huge hill over which dozens of buildings in typical ancient Chinese style were dotted and connected with each other via paths and rocky steps, some of which were at quite an incline, making navigation sometimes tenuous. The buildings are very impressive and every conceivable shape and size is represented. Each one has a name that can surely only have come from a loose Chinese translation into English, such as ‘the tower of cloud retaining eaves’, ‘the hall of virtuous glories’, ‘the pavilion of blessed shade’ and ‘the gardens of harmonious pleasures’. About two thirds of the total site is occupied by the vast Kunming Lake which comes complete with islands, natural land bridges and manmade stone bridges also that connect that various parts of the complex to each other. Because of our entry point, we had to first scale and pass over the huge hill and this ensured a slow but steady pace to our progress around the complex and made for some quite stunning views of the various pagodas and elaborately detailed buildings set amongst the trees. Everything about this place exudes mellowness and serenity. The paths and waterways with their weeping willows leaning gracefully over the water’s edge and the very buildings themselves all combine to produce a very relaxing atmosphere, like walking through a pleasant park on a gentle summer’s day. The white mist only seemed to add to this enchanted feeling, as new details on the not very distant horizon would slowly come into view as we moved around. The mist was so thick, in fact, that it wasn’t until we took a relaxing boat ride across the lake that we even realised that there was quite a bit more on the other side of it. We passed other boats eerily moving in and out of view through the mist, as we slowly made our way to the other side. We hadn’t actually planned on going to the other side, in fact, as we simply bought a couple of boat tickets for ¥8 ($1) each, thinking that we were taking a short cut along the lake edge to another part of the complex. Here again we fell victims to that blessed communications barrier. I’m sure it was clearly posted on the ticket booth where the boat was going but you’d have to have been Chinese to consider it clear. The serenity of the overall surroundings continued on the other side of the lake as we encountered ‘the temple of timely rains’, ‘the hall of embracing the universe’, ‘the garden of virtue and harmony’ and ‘the hall of benevolence and longevity’ on our travels. At one point, we stumbled into one of those attractions that our tickets afforded us entry to. This turned out to be ‘the hall of celebrated virtues’ and ‘the hall of nourishing pleasures great stage’. The great stage was playing host to a group of musicians playing traditional Chinese music and we sat and rested for a while whilst soaking up the very high-pitched clanging of bells, cymbals, stringed and various other percussion instruments. This degree of serenity can only be sustained for so long and it was by now approaching closing time. We’d been on our feet and moving through the park for a solid four hours all told and we felt that we had gained a good overall appreciation of the place. Accordingly, we made our way through ‘the chamber of distant gazing’, ‘the tower of dawn light’ and ‘the hall of serenity’ towards the exit. Deftly sidestepping all the exit touts, we headed straight for the nearby ‘arches of golden yellow’ for some ‘MacFood of shovel it down’ before hailing a taxi to take us back to the hostel. We made sure we hailed a ¥1,20 taxi and the ride back also came to ¥40 ($5) so it looks like were weren’t ripped off originally after all. Either that or we were successfully ripped off twice, one or the other. Back at the hostel, we sorted out some issues with our room (the bathroom floor is constantly wet from what appears to be a leak somewhere and we cannot get any reception on the TV). It took a while to get the hostel staff motivated to address these minor issues with the room so I took the opportunity to try to find out where I could go to hook up my laptop to the Internet. I was told to go to a very specific building just up the street but this turned out to be a photo development shop and they didn’t seem to have any Internet facilities at all. They did seem to understand what I was looking for and tried to give me directions to somewhere else but this new destination seemed a long way away so I gave up on the idea and came back. In the end, I unplugged one of the Internet PCs right here in the hostel and used its connection. It worked straight away so I started to update my website with the laptop connected. 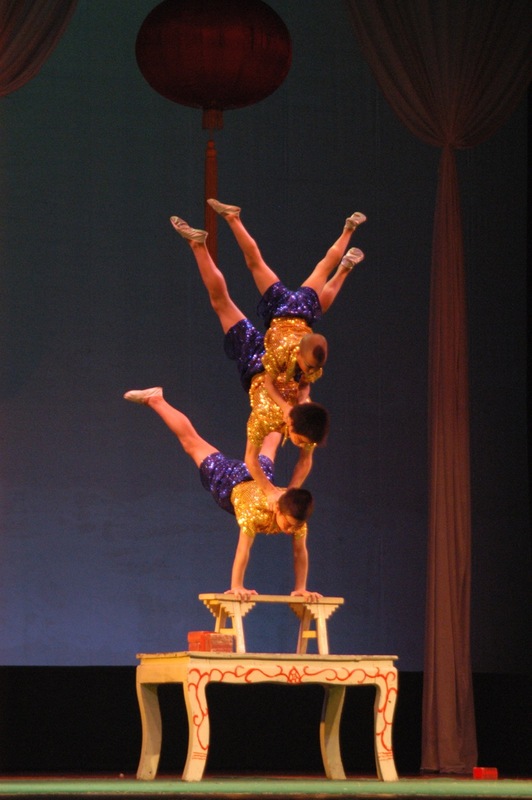 In the meantime, I inquired about where we could go to see some traditional Chinese acrobat shows. These are apparently all the rage here and we were particularly keen to take advantage of this whilst in Beijing. We decided pretty much on the spot to spend tonight at one of these theatre presentations and booked a couple of tickets for ¥110 ($13,50) each accordingly. This price would include the cost of our tickets as well as the transportation there and back. Our departure from the hostel for the theatre would give me an hour to upload my new photos and travel updates but the connection here is very slow and I had to abandon the whole thing mid way through when it came time to leave. The same staff member that I booked the tickets with actually accompanied us to the theatre in the taxi. It was quite a ride too that took the better part of thirty minutes to complete. We waited at the main entrance after arriving whilst she nipped inside to sort out the tickets. She came back with them along with one of their ‘get me home’ cards and a couple of ¥10 bills for the return taxi journey. With this, she bid us an entertaining evening and left. There were a plethora of tour coaches pulling up in front of the theatre and the predictable throng of touts and traders were working the tourists left, right and centre. Avoiding them comes naturally to us now and we went inside to take our seats. It was free seating but the rather tatty looking theatre auditorium was nearly full and we managed to find a couple of seat on the left hand side a few rows back form the stage. The show itself was quite nice with a wide variety of circus type acrobatic acts along with some martial arts acts and other odds and ends thrown in for good measure. Some of the performances were a bit unpolished but other than that it was good all round entertainment and we thoroughly enjoyed the hour or so that we were there. At the end of the final performance and after the applause died down, we waited for the main thrust of exiting audience to clear out and followed on behind them. There must have been fifteen or more tour guides waiting in the main reception hall, all holding coloured flags aloft, trying to attract their respective flocks. It was quite comical, in fact, to watch the hundreds of people slowly sort themselves out into their neat little groups. With our ¥20 in hand, we went outside, carefully avoiding the main thrust of persistent traders as we went, walked up the street a little and hailed an already moving taxi to take us home. He seemed unsure of where he was going and slowed down several times to study the little get me home card but eventually brought us here with just ¥14 showing on the meter. That made us ¥6 up on the day so we didn’t complain. We had planned on visiting the Great Wall tomorrow but have now decided instead to make it a rest day, on the heels of all the walking around we did today at the Summer Palace. We’ve decided not to go with one of the tour groups to the Great Wall and to make our own way there by public transport instead – that should be fun! It should work out much cheaper this way. We’ll take advantage of the rest tomorrow to sort out exactly where we need to catch the bus and work out all our contingencies. In the meantime, I’ve been sitting here on this tortuously slow Internet connection for the past couple of hours and have barely made it through 15% of all the uploads I need to do. At this rate, we will be completely through China altogether before anyone has a chance to read anything about it.